The Eagle Cliff Hotel was built by Bert Warner for the GOTL tourism trade. This sign is located at N41 51.675 W80 56.672. 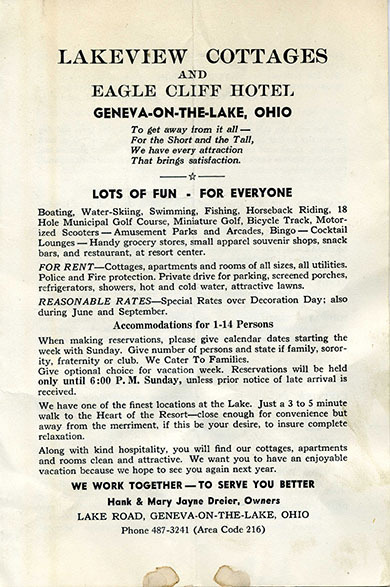 The Eagle Cliff is an example of a hotel built specifically to serve the late-19th century tourism business at Ohio’s first lakefront resort, Geneva-0n-the-Lake. The hotel was built by Bert Warner. 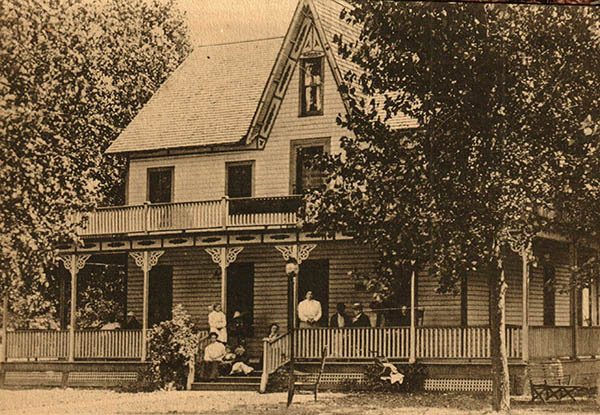 A 1913 newspaper article noted that “Eagle Cliff Cottage” was operated by Mrs. Amelia Warner. Proprietor in 1935 was F.H. Cannon. The next owner was Giles Cook, who also owned the Waffle House across the street. Hank and Mary Jayne Dreier owned it after Cook. 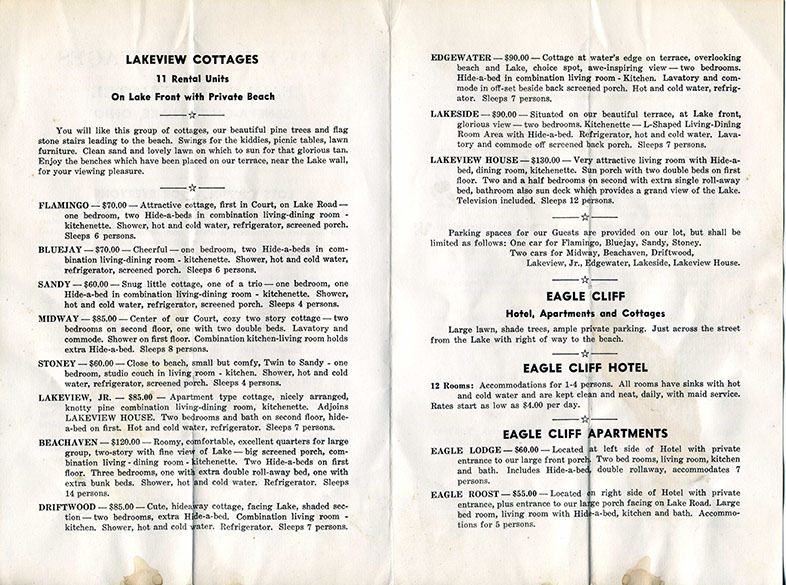 It was purchased in 1990 by Jerry, LuAnn and Lyndsey Busch, who renovated it for modern-day tourists and renamed it the Eagle Cliff Inn in 1995. It also has gone by the name of The Beach Club. The Eagle Cliff is on the National Register of Historic Places on Oct. 20, 1995. It’s significance is in the areas of entertainment and recreation. The name “Eagle Cliff” comes from a huge eagle’s nest that was located in a tree on a lot next to where the hotel would be built in 1880. The Warner family was very influential in the development of the resort town, and they also built Warner’s Colonial, which also still stands. 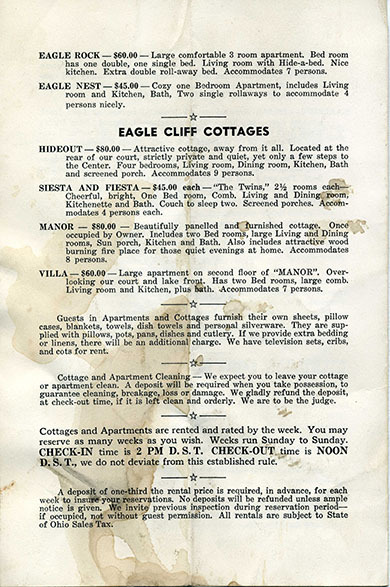 The Eagle Cliff was actually a cluster of accommodations. The Hotel itself had 18 rooms in 1935. There were cottages, as well. The Hideout, at the rear of the court; Siesta and Fiesta, twin cottages each offering 2.5 rooms; the Manor, a paneled cottage that accommodated eight persons; and the Villa. 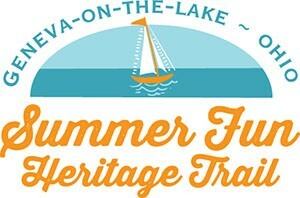 The Hideout, Siesta and Fiesta are part of the National Register of Historic Places listing. These buildings were moved to the property in the 1930s. Today, the Eagle Cliff has nine guest rooms on the second story and two on the third. The first story is used for year-around apartments. More information about the Eagle Cliff Inn is available at the facility’s website.